Imagine yourself a thirteen-year-old hundreds of miles away from home, in a strange city, and your mom leaves you at a bus station parking lot and drives off into the night with her lover. That’s the real life story of country music star Jimmy Wayne. It’s a miracle that Jimmy survived being hungry and homeless, bouncing in and out of the foster care system, and sleeping in the streets. But he didn’t just overcome great adversity in his life; he now uses his country music platform to help children everywhere, especially teenagers in foster care who are about to age out of the system. 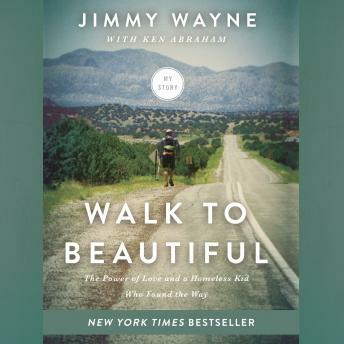 It also chronicles Jimmy’s rise to fame in the music industry and his Meet Me Halfway campaign: his walk halfway across America, 1,700 miles from Nashville to Phoenix, to raise awareness for foster kids. Join Jimmy on his walk to beautiful and see how one person really can make a difference. A Walk to Beautiful is a heart warming, troubling yet inspirational story of survival and determination. It's beautifully written too. I wish I could hug Jimmy Wayne, he's a great man!! It's the best audio book I've read so far.